Tunisia's Islamist Victory: A Lesson for Egypt and Libya  or Not? 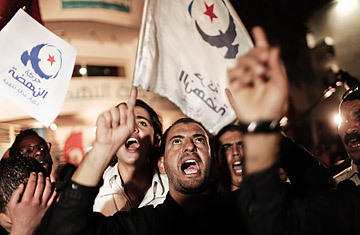 Supporters of Ennahda, a moderate Islamist party, celebrate election results in front of the party headquarters in Tunis, Tunisia, Oct. 25, 2011. Can the West Learn to Love the Islamists? The results are in, and the Islamists have won. In Tunisia's first democratic election since the January revolution that ousted President Zine el Abidine Ben Ali, the popular Islamist Ennahda party says it swept 40% of the votes  more than any other party  and just as everyone thought they would. A set of electoral regulations ensures that no party  including Ennahda  can control more than 30% of the seats in the newly elected constitutional assembly. But their win nonetheless carries major import for the yet-to-be-determined outcome the Arab Spring. "It confirms what we already know: that Islamist parties are likely to do well in these elections for a large number of reasons," says Marina Ottaway, a Middle East expert at the Carnegie Endowment for International Peace, of the slate of post-revolution elections planned or tentatively planned in Egypt, Tunisia, and Libya. Tunisia's vote marks the first time that an Islamist party has won a majority in an Arab election since Hamas' 2006, which resulted in a split of the Palestinian territories between two rival factions. The Arab world's only other experience with an Islamist win came in Algeria's 1991 parliamentary race, during which the military swept in to block a full Islamist victory, sparking a bloody 10-year civil war. Ennahda's sweep in Tunisia is unlikely to yield the same results; most participants and monitors hailed the election's peaceful and transparent process as a success, and the military has appeared both cooperative and willing to cede power to a civilian government. But the results  and how they came about  will certainly prompt some soul-searching and strategizing across the region. "The real test now is what happens in the next few weeks," says Ottaway. Whether Ennahda succeeds in implementing its promise of a broad-based coalition will likely impact the process in Egypt, where the Muslim Brotherhood's Freedom and Justice party is poised to capture a sizeable proportion of the votes in the parliamentary race slated for November 28. "In Egypt, there is this great lot of people in the liberal spectrum that are ready to jump into the arms of the military because they are so afraid of the Muslim brotherhood," Ottaway says. But if Ennahda proves willing to ally with secular parties to form a government, that should alleviate some Egyptian fears. "I think that should show Egyptians that even if the Freedom and Justice party does very well, it doesn't mean the country is going to become an Islamic republic." Either way, the region's secularists will still have to deal with their own demons. In Egypt where some 40% of the population lives on less than $2 a day and the literacy rate is among the lowest in the Arab world, secular parties and politicians are often regarded as elitist and distant, while Islamist parties have garnered the most success in attracting poor constituents. Tunisia's secularists suffered from the same affliction. And indeed, it may have been one of the decisive factors that thwarted their success. On the eve of Tunisia's vote, the Ennahda office in the western, mountainous town of el-Kef was still bustling with last minute preparations. Ennahda officials told TIME they were optimistic and excited, having spent the prior weeks and months so devoted to the labor of campaigning that the volunteers had barely slept. "It was a direct, door-to-door strategy," the office's campaign chief Ibrahim Zoghlamy said of their get-out-the vote efforts. Unlike other parties, he said, Ennahda made sure to visit every town in the region. But in a different party office, not far away, the utility of such tactics seemed to have been lost on the Islamists' center-left competitors. Monia Boukaaba, a candidate for the Modernist Democratic Pole, said her coalition went door-to-door too  but not in the same way. "We didn't knock, we just put fliers under the doors," she said; a technicality, perhaps, but it may have been the difference that cost them. And Egyptian voters will likely find parallels in political process next month. "There is a huge difference in the way the secular parties and the Islamic parties conceive of what they should do in order to win an election," says Ottaway. The Islamists tend to operate more like the socialist parties of Europe; they engage in social welfare activities and they mingle with their constituents. The secular parties have had trouble getting their hands dirty. "Essentially, they spend a lot of time debating. They spend a lot of time writing columns in the newspaper. But they have not really involved in organizing their constituents," says Ottaway. Tunisian liberals complain that Ennahda won because it has been around longer; many of the newer parties borne of Egypt's Tahrir Square have voiced similar grievances against the Muslim Brotherhood. To some extent, it's true. "They are famous for being against Ben Ali. They're known," says Mohamed Barakat, a resident of Tunis, who voted for Ennahda. But even with the experience, Islamist politicians argue that they've still had to overcome the negative image problem left by the old regime. "Mostly they ask questions about polygamy, and if we'll make women wear hijab," said Zoghlamy of the Tunisians his volunteers spoke to during campaign season. "Of course we explain to them that that's not the case." There is also the issue of foreign funding. Tunisian liberals and secularists have accused Gulf states like Saudi Arabia and the United Arab Emirates of secretly funding Ennahda in a drive to spread their brand of conservative Islam to North Africa's most secular state. In Libya, officials from the National Transitional Council and fighters alike have praised the assistance of Qatar, the tiny but wealthy Gulf country that has channeled assistance to the rebels-turned-fledgling government since the beginning of Libya's revolution. And in Egypt, allegations of foreign funding and foreign agendas fly in all directions  from conservatives to liberals, and vice versa  in political rhetoric aimed at an increasingly suspicious and fearful population. Grounded or not, the claims may do little to further democracy. "Frankly, even if they got some money from the outside, I think the allegations that they were simply buying votes is wishful thinking by the people who were very much against the Islamists and who do not want to admit that these groups have genuine support in the country," says Ottaway of Tunisia's electoral outcome. Genuine support will matter most if the next round of Arab Spring elections goes as smoothly as Tunisia's did. But there's no guarantee that will be the case. And in the end, the process may outweigh the savvy of one party over another. At the end of next month, Egyptians will enter the first phase of their own democratic transition with far fewer democratic guarantees than the Tunisians enjoyed. Egypt's military junta, which took over after the February ousting of President Hosni Mubarak, has ensured there will be no international monitors. The elections will occur over three stages, rather than on one day, which could lead to allegations of fraud. Unlike Tunisia, there has been little government effort to educate Egyptians about the vote. And it remains unclear what procedures will be taken to ensure that no one votes twice. "Egypt is going to have a much more complicated election, and I think that Egypt has chosen to run the election in a way that could easily lead to disaster," Ottaway says. Tunisians, having witnessed democratic success, on the other hand, are likely to expect more of the same, ensuring that even an Islamist-dominated government will be tempered by secular voices. In Egypt, where the military seems far less willing to cede power to a civilian government, or even to allow transparency in its selection, the rise of any party will be colored by the military's presence and role. And in Libya, where a full-blown revolution has successfully overthrown the regime and killed Muammar Gaddafi through months of civil war, the outcome is anything but certain. Libya's transitional leadership has declared that it will base all legislation on Islamic law in post-Gaddafi Libya. But even if all three revolutions of the Arab Spring yield Islamist governments, their success at governing peaceful democratic states may be entirely different.